Produced by spraying equipment manufacturer HARDI Australia , the LowDrift and MiniDrift spray nozzles are popular due to their precision performance and drift reducing spray qualities. 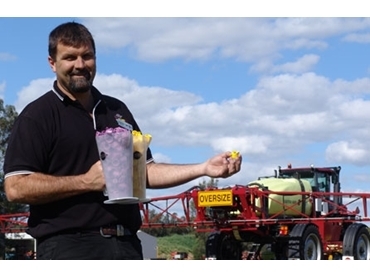 ‘Drift reduction continues to be the hot topic of discussion between those with a vested interest in the spraying industry, with braodacre farmers being the quickest to adopt these new noxxle options’, said HARDI Australia product manager, Corrie Eichner. LowDrift sray nozzles will deliver medium to coarse spray quality, while the MiniDrift spray nozzles deliver a coarse to very coarse spray quality. A set of each will satisfy most application needs, providing users give careful consideration to the spraying situation and the chemicals being used. For a quick and easy way to select the right nozzle or switch between nozzles during spraying, HARDI Australia triplet saddles are ideal. Many variables have to be taken into consideration when undertaking a spray task, some are controllable and some not, but they all have a bearing on the efficacy of the application and the return on investment. The design of the LowDrift spray nozzle includes a pre-orifice which creates a pressure drop within the nozzle so that the final outlet orifice produces larger and slower moving droplets. This makes the droplets less sensitive to wind, reducing drift by up to 50% compared to standard spray nozzles. ‘What happens is a thicker spray sheet emerges from the nozzle due to the lower outlet pressure. This breaks up into bigger droplets unlike a standard flat fan nozzle, which has a thinner spray sheet and finer droplets susceptible to drift,’ explained Eichner. The MiniDrift spray nozzle is an air induction design and is fitted with a venturi air inlet between a pre-orifice and the outlet orifice. This creates a negative pressure in the nozzle which allows air to flow in through the side holes and become infused into the liquid droplets. The air and spray liquid generate large slow moving droplets reducing drift by up to 75% over standard spray nozzles. HARDI spray nozzles are moulded in durable Syntal thermoplastic and are available in the ISO standard colour coding and sizing of 015, 02, 025, 03, 04 and 05. They can be purchased as a cap and nozzle all-in-one design, or nozzle tip only to fit into other manufacturers nozzle caps. These spray nozzles have a 110 degree flat fan spray angle and are designed for 50 cm nozzle spacing with a boom height of 35 – 70 cm.